The 'Skeeter Bites Report: Were U.S. Journalists, Facing Prison in North Korea, Kidnapped on Chinese Territory? Were U.S. Journalists, Facing Prison in North Korea, Kidnapped on Chinese Territory? As two American journalists convicted Monday by a North Korean court on charges of illegally entering the isolated, hard-line Stalinist country face up to 12 years of hard labor in a prison camp, two important questions about their seizure at its border with China in March remain unanswered. Did the journalists, Euna Lee and Laura Ling -- while working on a story for Current TV about alleged trafficking of North Korean women -- illegally cross the border into North Korea, as Pyongyang claims they did? Or did the North Koreans -- who have a long history of kidnapping foreign nationals -- illegally cross the border themselves and abducted the reporters on the Chinese side, violating Beijing's territorial sovereignty? Three months after the incident, there is still no clear answer to those questions, as details remain murky. A third American -- a cameraman who accompanied Lee and Ling and who managed to avoid capture by the North Koreans -- might have the answer. But he's not talking. Although the cameraman, Mitch Koss, who also works for the California-based Current TV, escaped capture by the North Koreans, he was detained by Chinese authorities for several days after the incident before he was allowed to leave China, according to a statement by the press-freedom group Reporters Sans Frontieres (Reporters Without Borders, or RSF). The journalists' guide, an unidentified Chinese citizen of North Korean origin, also evaded North Korean capture, but he, too, was detained by Chinese police and is still in custody, according to RSF. North Korean border police detained the two on March 17 as they were filming at a bridge crossing over the Tumen River, which forms the eastern portion of the border between North Korea, China and Russia, near the city of Tumen (The Yalu River forms the western portion). What's not clear is whether the two reporters were on the North Korean side of the bridge or on the Chinese side when they were seized. Other journalists who have visited the border between North Korea and China say that it is almost as porous as that between the United States and Canada. The Tumen River region inparticular has generated trade and traffic -- along with a sizable North Korean population living in exile on the Chinese side or traveling back and forth looking for economic opportunities. RSF and the International Women's Media Foundation (IWMF) have launched a joint online petition calling for the immediate and unconditional release of Lee and Ling. 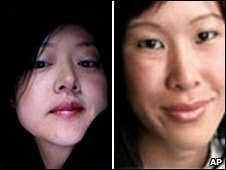 "Laura Ling and Euna Lee were taken into custody on the Chinese-North Korean border while reporting on the fate of North Korean refugees, and, more specifically, on the trafficking of women," the two organizations said in a joint statement. "Pyongyang authorities have no reason to hold them or to accuse them of illegal activities. They should be freed at once." The timing of the incident and subsequent trial of the journalists comes at a particularly tense time, amid North Korea's aggressive pursuit of a nuclear weapons stockpile and its increasing belligerence toward Japan, South Korea and the United States. Indeed, the North Koreans appear intent on making Lee and Ling pawns in a high-stakes gamble to wrest concessions from the U.S. on the nuclear issue, analysts say, creating a major foreign-policy dilemma for the Obama administration. The White House is struggling to keep its efforts to free the reporters separate from efforts to resolve a nuclear and missile dispute with the North. But if it turns out that the North Koreans abducted Lee and Ling on the Chinese side of the border, it potentially could have serious repercussions for relations between North Korea and China. Publicly, Beijing says that Pyongyang's provocative actions of late are yet another illustration of brinkmanship aimed at attracting U.S. attention. China decried the North’s nuclear tests in late May, but remains uncommitted to tougher sanctions against the North, preferring to pursue quiet diplomacy. Privately, however, Beijing is becoming increasingly annoyed with Pyongyang's actions in recent weeks, according to diplomatic sources who spoke on condition of anonymity, noting that China was "furious" with the North over its first nuclear test in 2007 -- and hinting that the Chinese may not look kindly on its territorial integrity being breached by the North Koreans, if the two journalists were, in fact, on the Chinese side of the border when they were seized. The Chinese, after all, fought a series of bloody border clashes with the Soviet Union in 1969 over a centuries-old territorial dispute -- and over a bitter ideological feud between Beijing and Moscow over leadership of the communist world -- that brought the two giants to the brink of a full-scale war against each other (The territorial dispute was resolved after the Soviet Union collapsed in 1991). China last week joined the other four permanent members of the United Nations Security Council -- Britain, France, the United States and Russia -- as well as South Korea and Japan in drafting a new UN resolution against the North in response to Pyongyang's nuclear test on May 25. The resolution, according to The Associated Press, calls for expansion of an existing arms embargo, imposes tighter restrictions on Pyongyang's financial dealings with the outside world, freeze the assets of North Korean companies abroad. The resolution, the AP reported, also authorizes searches of ships on the high seas suspected of carrying banned weapons and nuclear material if the country whose flag the vessel is flying gives consent. A vote by the Security Council on the resolution is expected by Saturday, the Seoul-based English-language daily The Korea Herald reported early Thursday, citing diplomatic sources. "It was a slap in the face for the North that China and Russia also chose to participate in the sanction," the newspaper quoted Kim Tae-woo, vice president of the Korean Institute for Defense Analyses, as saying. "This may help prevent another nuclear test by the North." NORTH KOREA KIDNAPPED AT LEAST 13 JAPANESE . . . If it turns out that the North Korean guards seized Lee and Ling on the Chinese side of the border, it would not be the first time that Pyongyang's agents have abducted foreign nationals outside of North Korean soil. The North has a long history of kidnapping foreign nationals, particularly South Koreans and Japanese. Of the two Americans captured by North Korea, Lee is of Korean descent and Ling is an ethnic Taiwanese. From 1977 to 1983, North Korean agents kidnapped Japanese nationals and spirited them to the isolated, hard-line Stalinist country. Although the Japanese government officially acknowledges that 16 Japanese citizens -- eight men and eight women -- were abducted, Pyongyang may have snatched as many as 80 Japanese, according to a North Korean agent who defected to Japan in 2002. Most of the missing were in their 20s, although the youngest, identified as Megumi Yokota, was just 13 years old when she disappeared in November 1977 from the Japanese west coast city of Niigata. The North Korean government claims that she committed suicide in 1994. For its part, Pyongyang admitted in 2006 to kidnapping thirteen Japanese citizens. A possible seventeenth case, that of Kyoko Matsumoto, has been under evaluation for official recognition since then. Although no new evidence has been put forward recently, in December 2006 the Japanese National Police stressed they had not forgotten the case and hope to transmit that same message to the Japanese people. But the number of Japanese nationals kidnapped by North Korean agents pale in comparison to the number of South Koreans abducted by Pyongyang -- over 80,000 during the Korean War of 1950-53 and nearly 500 in the half-century since then -- the bulk of them in the late 1970s. Most of the postwar South Korean abductees were snatched while they were fishing in the Yellow Sea near the Demilitarized Zone that marks the border between the two Koreas -- often called "the last front line in the Cold War" between the capitalist South and the communist North -- but some were abducted by Pyongyang's agents in the heart of the South Korean capital, Seoul, and elsewhere. North Korea has continued to abduct South Koreans into the 21st century, most recently in the cases of priest Kim Dong-sik, who was abducted in 2000, and Jin Gyeong-suk, a North Korean defector to the South who was abducted in 2004 when she had returned to the North-South border area on her South Korean passport. One of the most famous cases of abduction was that of actress Choi Eun-hee and her husband, film director Shin Sang-ok, who were kidnapped by North Korean intelligence agents in Hong Kong in 1978. They were abducted on the direct orders of North Korean leader Kim Jong-il, whose late father, Kim Il-sung, was in power in Pyongyang at the time. The younger Kim wanted to use them to improve the North Korean film industry. Shin attempted to escape, but was captured and spent five years in a "re-education" camp, before being reunited with his wife. While living in North Korea, Shin made the monster movie "Pulgasari." They escaped while on a visit to Vienna in 1986. Shin died in 2006; Choi, now 82 and retired, lives in Seoul. The South Korean government has been accused of neglecting the issue of abductees, particularly during the anti-communist military dictatorship, as people feared the exposure of the existence of their relatives in North Korea. The families of the two jailed journalists and Secretary of State Hillary Rodham Clinton appealed to Pyongyang Monday for clemency, as President Obama has become directly involved in developing a strategy to free them. Obama is holding Oval Office talks with his closest advisers -- including Clinton -- and sources say that one leading option may be to send a special envoy in the hope of negotiating the women's release. Clinton said the Obama administration was "engaged in all possible ways through every possible channel to secure their release." Clinton urged the North to treat the women's case as separate from the Security Council debate on the nuclear issue. "We think the imprisonment, trial and sentencing of Laura Ling and Euna Lee should be viewed as a humanitarian matter," she said. "We hope that the North Koreans will grant clemency and deport them." Agence France-Presse reported Wednesday that the White House appeared to be contemplating troubleshooting roles for former Vice President Al Gore or New Mexico Governor Bill Richardson, a former U.S. ambassador to the UN under President Bill Clinton. Richardson, who in the 1990s negotiated the release of two other Americans from North Korean imprisonment, said the administration had contacted him for advice in the case. Richardson predicted negotiations for their release would now begin in what he called a "high-stakes poker game." In a joint statement, the reporters' families issued an apology on their behalf for their "accidentally" straying onto the North Korean side of the border bridge and pleaded to Pyongyang for compassion. "We are very concerned about their mental state and well-being," the statement said, adding that Ling suffers from an ulcer and Lee's four year-old daughter "is displaying signs of anguish over the absence of her mother." Ling's sister, Lisa, is a former co-host of the ABC daytime TV talk show "The View" and is now a contributing correspondent for National Geographic Channel's "Explorer" TV show. Koss, the cameraman who accompanied Lee and Ling on their assignment, has not made any public statements since he was released by the Chinese authorities. It is not known if Koss was able to record any video footage of his colleagues as they were taken away by the North Koreans on the bridge. Nor is it known whether -- if any such footage exists -- Koss is in possession of it or if it was confiscated by the Chinese authorities when they detained him. Current, headquartered in San Francisco, is a "cross-platform" media company co-founded in 2005 by Gore and businessman Joel Hyatt. Its cable television network, Current TV, and its Web site, Current.com, aim at a young-adult audience. Gore is chairman of the company's board; Hyatt is its president and CEO. A company spokesman, contacted by The 'Skeeter Bites Report on Wednesday, declined to comment on the plight of Lee and Ling, "in deference to their families." Why is RSF issuing a statement, and not Current? Is there a link? Koss as cameraman is a sort of mis-statement, considering his experience and his usual role as Ling's producer. Why are the media continuing to call him that? And where's the local fixer?